New | Softbound | 384 pp | Size: 8.5" x 10.5" x 1"
Author James Green is the founder of Simplers Botanical Company and is a professional founding member of the American Herbalists Guild and United Plant Savers. Green is also known for his best-selling book "The Male Herbal". . 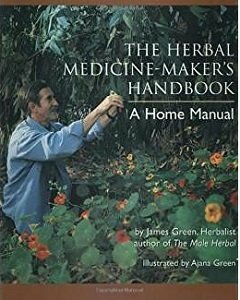 The Herbal Medicine-Makers Handbook blends this herbalist author's natural home remedies with perspectives on the art of herbal medicine's making, offering the folk recipes for extractions and plenty of recommendations for usage. The result is far more in-depth than your usual herbal recipe book, packed with insights on how to extract herbs, make tinctures, and apply them properly.